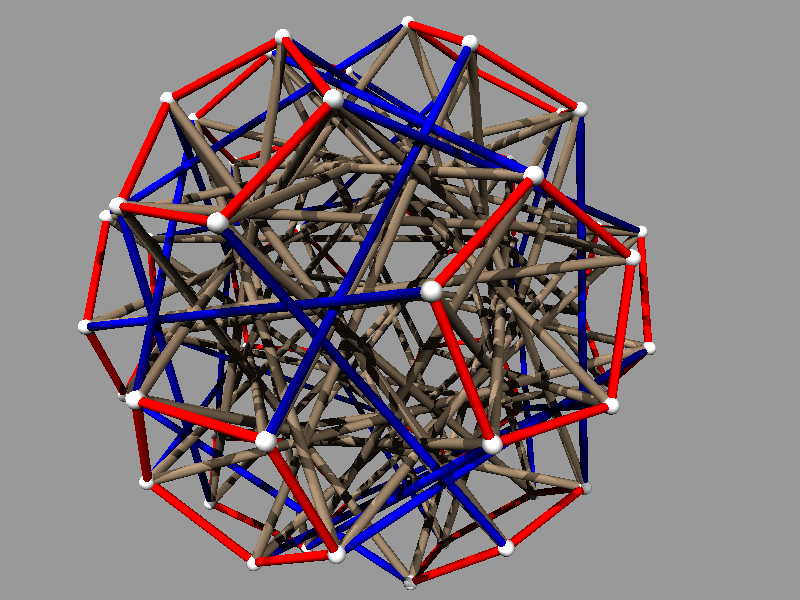 This is access to a catalog of several hundred tensegrity structures that are held rigidly together with incompressible struts and inextendable cables connecting point nodes. These structures are highly symmetric in the sense that there is a symmetry of the structure that takes any node to any other, there is a symmetry of the structure that takes any strut to any other, and there are two classes of cables, where there is a symmetry of the structure that takes any cable to any other in the same class. The picture on the left shows an example you can rotate. The picture on the right, which does not rotate, was also made from output of the program. To go to the catalog, click Run Program, and follow the prompts which will appear in the text area in the lower right hand corner. For more details, see the links in the sidebar.